CERN held an Open Doors weekend in April 2008 with Saturday 5 April for CERN for staff and users and families and Sunday 6 April for the general public. To coincide with this Alan Walker arranged a visit to CERN for Peter Higgs and a party from the School of Physics and Astronomy. In addition to Peter the party included Head of School Richard Kenway, Senior Lecturer Alan Walker, the SCI-FUN Development Officer Peter Reid, undergraduate and aspiring science journalist Jessica Griggs as well as Professor Franz Muheim and Dr Yuehong Xie of the particle physics experiments group. Photographs were taken by Alan Walker, Peter Reid and Claudio Marchelloni of the ATLAS experiment and CERN who retain copyright. These images should not be used without express permission. Peter Higgs in the LHC tunnel. Peter Higgs in the long straight section of the Large Hadron Collider tunnel, just before the underground ALICE experimental hall. Photograph copyright Alan Walker, University of Edinburgh. Peter Higgs outside the CMS construction hall. Peter Higgs, Elizabeth Gibney of the CMS collaboration and Jessica Griggs talking after the visit to the CMS construction hall and underground experiment hall. Photograph copyright Alan Walker, University of Edinburgh. Visiting party at the CMS experimental site. Left to right: Richard Kenway, Peter Reid, Peter Higgs, Jessica Griggs and Yuehong Xie at the CMS site in Cessy. Photograph copyright Alan Walker, University of Edinburgh. Peter Higgs in the SPS tunnel. Richard Kenway and Peter Higgs during the visit to the SPS tunnel and the site of the UA1 experiment. Photograph copyright Alan Walker, University of Edinburgh. Peter Higgs in the ATLAS Control Room. From left to right: Richard Kenway, Franz Muheim, and Peter Jenni ATLAS spokesperson on the visit to the ATLAS Experiment Control Room. Photograph copyright Alan Walker, University of Edinburgh. Peter Jenni and Peter Higgs at the ATLAS experiment. 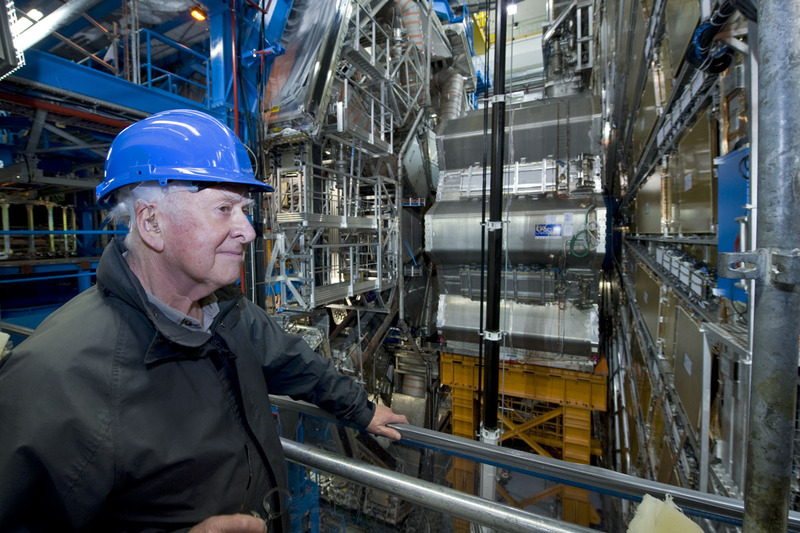 Peter Jenni, spokesperson for the ATLAS experiment, with Peter Higgs in front of the ATLAS experiment. Photograph copyright Claudia Marcelloni, ATLAS & CERN. Peter Higgs at the ATLAS experiment. Peter Higgs in front of one of the ATLAS end cap toroidal magnets on his visit to the ATLAS cavern. Photograph copyright Claudia Marcelloni, ATLAS & CERN. Peter Higgs and others visiting the ATLAS experiment. From left to right: Peter Jenni, Richard Kenway, Franz Muheim, Peter Higgs, Alan Walker and Peter Reid whilst visiting the ATLAS experimental cavern. Photograph copyright Claudia Marcelloni, ATLAS & CERN. Peter Higgs at the CERN Restaurant 1 terrace. Left to right: Ronnie Kerr, Peter Higgs, Jessica Griggs and Richard Kenway relaxing at CERN Restaurant 1 after the conclusion to the visit. Photograph copyright Alan Walker, University of Edinburgh. This article was last updated on Sep 1, 2014 .